Chief Minister Devendra Fadnavis and Union Minister Nitin Gadkari to inaugurate the first 5.6 km stretch of the ambitious Metro Rail Project. It’s been around two years since the work for the ambitious Nagpur Metro Project started and Nagpurkars are eagerly waiting for the completion of the project. While the completion of the entire 37 km stretch might take another 2 years, the good news is that the 5.6 km stretch from the airport to Khapri might start soon. 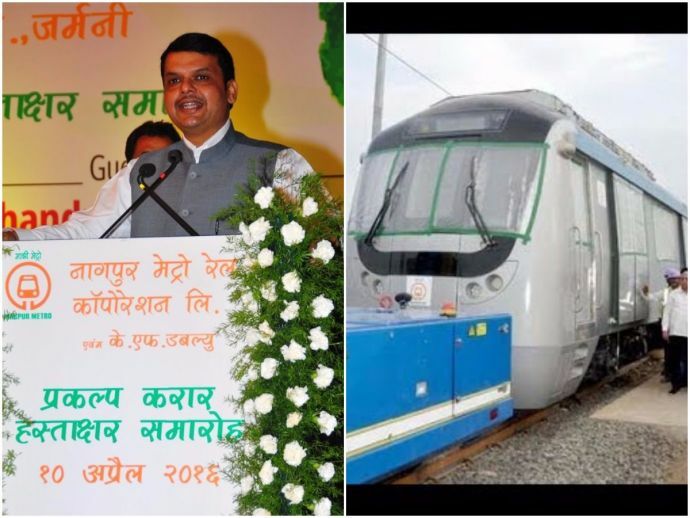 Chief Minister Devendra Fadnavis and Union Minister for Surface Transport and Shipping, Nitin Gadkari would be witnessing a formal trial run of Nagpur Metro from Chinchbhuvan to the New Airport on 30th September at noon. The formal approval of the Commissioner of Railway Safety is yet to come and the sanction will be granted only after the physical inspection of the Nagpur Metro is complete. It is only after this that the approval for commercial operations will be granted. The Nagpur Metro team, however, is working hard towards the success of this trial run. The Chief Minister will also be launching a Maha Card for the metro services in Nagpur, which would be in tune with a similar integrated card in Mumbai. This card will ensure seamless travel by any mode of public transport across the two cities. According to the sources, the commercial operations of the metro are likely to start in November. Since the internal trial run of the 5.6 km stretch was quite successful, the Metro Rail authorities have decided to take a formal trial run in the presence of these eminent leaders. The city has received 6 coaches on lease for 3 years from Hyderabad. The coaches will be verified and certified by the Research Design and Standard Organisation (RDSO). Since its inception under the leadership of Brijesh Dixit, almost 2 years ago, the Nagpur Metro Rail Project has completed 45% of work. The full-fledged operations of the Nagpur Metro, however, are likely to start by 2019.